In Exercise – I given basic concepts of average chapter with formulas like Weighted Average, Average age /weight, Average Speed.. etc. 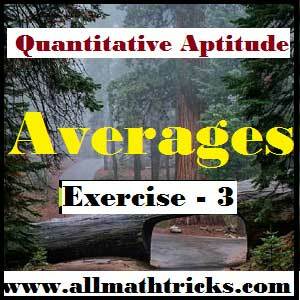 In Exercise – II Covered average of numbers formulas like average of natural, even, odd, squares of natural, squares of even, cubes of even numbers … etc. Now in this Exercise given remaining formulas with some practice average problems to cover all formulas in Exercise I & II. Example – 1 : The average of 52 numbers is 45. if two numbers, namely, 55 & 45 are discarded from the set of number, then find average of the remaining numbers. Example – 2 : Find the average of the first 97 natural numbers. Example – 3 : Fina the average of first ten whole numbers. According to above formula = (10- 1) / 2 = 4.5. Example – 4: Fins the average of first 10 multiples of 12. 12 ( 10+1) / 2 = 6 x 11 = 66. Example – 5 : The average of 5 consecutive numbers is 18. Then find height of these numbers. Solution: Here the number would from an Arithmetic Progression(AP) with common difference” 1″ and the middle term ( 3rd term) as 18. Thus, the number would be 16, 17, 18, 19 & 20. The highest of these numbers would be 20. Example- 6: The average of ten numbers is 15. If each number is multiplied by 12, then find the average of the new set of numbers. Solution: When we multiply each number by ” X “, the average would also get multiplied by “X”. Hence the average of new set of numbers = 15 x 12 = 180. Example – 7: In a certain school, there are 60 boys of age 12 each, 40 of age 13 each, 50 of age 14 each and 50 of age 15 each. Find the average age (in years) of the students of the school. Example – 8: The average of 25 innings of a batsman is 40 and another 30 innings is 50. What is the average of all the innings? Example – 9: The average of a batsman after 25 innings was 62 runs per innings. If after the 26th inning his average increased by 1 run, then what was his score in the 26th inning? Example – 10: The average marks of a group of 20 students on a test is reduced by 4 when the topper who scored 90 marks is replaced by a new student. how many marks did the new student have? The new student marks = 90 – 80 = 10. Example – 11 : The average of marks obtained by 77 candidates in a certain examination is 17. If the average marks of failed candidates is 8 and passed candidates is 19 then find the number of passed candidates in examination? n = 7 x 9 = 63. Example – 12: A batsman his 20th innings, missed a century by 5 runs and there by increased his average by 4. what is his average after 20 innings. Example – 13 : The average age of the three boys is 15 years. Their ages are in the ratio 3:5:7. Then find the age of the oldest boy. Age of the oldest boy = 21 years. Example – 14 : The average age of a group of men in increased by 5 years when a person aged 18 years is replaced by a new person of aged 38 years. How many men are there in the group? Solution: Here A person aged 18 years is replaced by new person of age 38 years. The difference in age = 38 – 18 = 20. Now the new average increased by 5 years. So number of persons in that group = 20/5 = 4 persons. Example – 15: The average of 71 results is 48. If the average of the first 59 results is 46 and that of the last 11 results is 52. Find the 60th result. x = 3408- 2714 – 572 = 122. Example – 16 : The average temperature on Monday, Tuesday and Wednesday was 41 oC and on Tuesday, Wednesday and Thursday it was 40 oC. If on Thursday it was exactly 39 oC , then find temperature on Monday. Example – 17 : The average salary of the entire staff in a office is 250 per day. The average salary of officers 750 and that of non- officers is 200. If the number of officers is 15, then find the number of non-officers in the office. Example – 18: They are equal number of groups and average age of “A “group and ” B” group is 20 years. If “C” group were to replace” “A group, average would be 19 and if “C” group were to replace “B” group, the average would be 21. What are the ages of groups A, B and C respectively? Example – 19: The average of 8 readings is 24.2, out of which the average of first two is 18.5 and that of next three is 21.1. If the sixth reading is 5 less than seventh and 7 less than eighth, what is the sixth reading? Example -20: Out of three numbers, the first is twice the second and thrice the third. If their average is 121, find the numbers. The given numbers are 198 , 99, 66. Example – 21: The student got average marks of 13 papers is 65. The average of the first 7 papers is 75 and last seven papers is 60. Find the marks obtained in the 7th paper. m = 525 + 420 – 845 = 100. Example – 22: A person divides his total journey distance into three equal parts and then he travel each part of distance travel with the speeds of 20, 15, and 10 km/hr respectively. Find his average speed during the whole journey. Example – 23 ; One-fourth of a certain journey is covered at the rate of 25 km/hr, one-third at the rate of 30 km/hr and the rest at 50 km/hr. Find the average speed for the whole journey. Rest of journey means ( ) = 5 / 12 with the speed 50km/hr. Example – 24 : A person covers 18 km at 10 km/hr, 16km at 8 km/hr and 30km at 6 km/hr. Then find average speed in covering the whole distance. The average speed of the whole distance = 80/11 = km/hr.